Pixar has a lot to prove with Toy Story 4. Nine years have passed since Toy Story 3 and most would say it was a near-perfect ending to the beloved franchise, with Buzz, Woody, and the gang riding off into a happy future. But rumors of a fourth film persisted, and they were finally confirmed. Now as its release approaches, Toy Story 4 must prove why it needs to exist. That idea courses through the new trailer, as Woody suddenly finds he is no longer the favored toy of their owner, Bonnie. 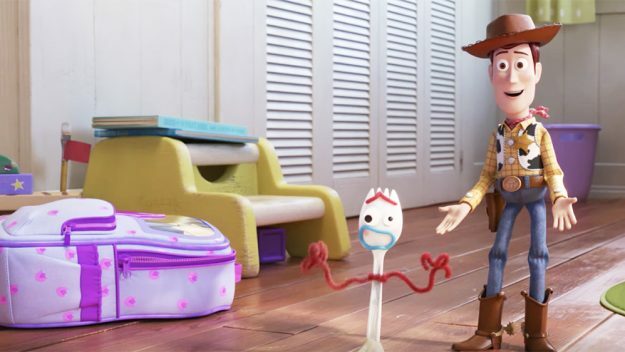 She's instead created her own favorite toy, Forky, and it's up to Woody and the others to make him feel at home while on a grand carnival adventure. There lost toys living out in the world make leaving the comfort of Bonnie's home an idea whose time might have come. We also get a handful of new characters voiced by Keanu Reeves, Christina Hendricks, and Ally Maki. Reeves voices Duke Kaboom, who is a 1970s action figure based on one of Canada's great stuntmen. Hendricks voices Gabby Gabby, a 1950s pullstring doll with a voice defect that has left her locked awa in an antique shop. And finally, there's Giggle McDimples, a miniature cop from the actual 1980s toyline. She's described as the best friend of Woody's longtime love, Bo Beep (Annie Potts), who returns to introduce him to a much bigger world. Here's the synopsis followed by the brand new trailer: Woody has always been confident about his place in the world and that his priority is taking care of his kid, whether that’s Andy or Bonnie. But when Bonnie adds a reluctant new toy called “Forky” to her room, a road trip adventure alongside old and new friends will show Woody how big the world can be for a toy. Directed by Josh Cooley (“Riley’s First Date?”) and produced by Jonas Rivera (“Inside Out,” “Up”) and Mark Nielsen (associate producer “Inside Out”), Disney•Pixar’s “Toy Story 4” ventures to U.S. theaters on June 21, 2019.